All items are available for viewing on approval. I have a constantly changing stock of Norwegian and all Scandinavian essays, proofs, reprints, and test stamps. Most of such items sell before they get to the website or price lists. What are you seeking? 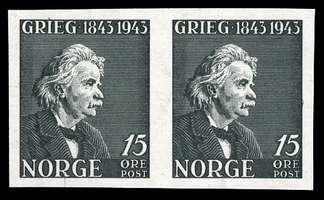 One actual essay design for the 1943 Edvard Grieg issue (Scott #255-8) is known and available to collectors. This is of a small-size stamp design with the same lettering appearance as the issued stamp, but a much different portrait. The essays are only recorded imperforate on extremely smooth yellowish-white paper, in red and black.The printing quality is superior, giving the impression of an engraved stamp, but the essays are surface printed, not engraved. 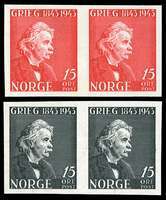 1943 Edvard Grieg essay set of two in Red and Black, singles. Imperforate, ungummed as "issued", on extremely smooth yellowish-white paper. Very high quality surface printing giving the appearance of an engraved stamp. Extremely scarce and rarely seen in the market. An exceptional item for the Norwegian collection or Music/Composer collection. Normally $390.00 for the set of two. On sale for $340!! 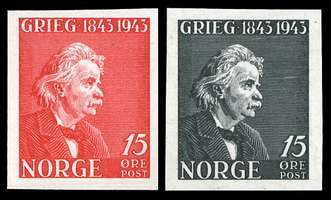 1943 Edvard Grieg essay set of two pairs in Red and Black, singles. Imperforate, ungummed as "issued", on extremely smooth yellowish-white paper. Very high quality surface printing giving the appearance of an engraved stamp. Extremely scarce and rarely seen in the market. An exceptional item for the Norwegian collection or Music/Composer collection. 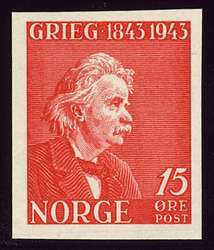 1943 Edvard Grieg essay in Red, single. Imperforate, ungummed as "issued", on extremely smooth yellowish-white paper. Very high quality surface printing giving the appearance of an engraved stamp. Extremely scarce and rarely seen in the market. An exceptional item for the Norwegian collection or Music/Composer collection. 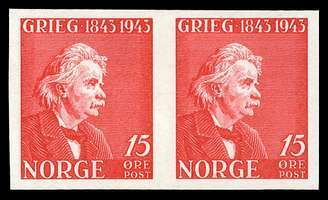 1943 Edvard Grieg essay in Red, pair. Imperforate, ungummed as "issued", on extremely smooth yellowish-white paper. Very high quality surface printing giving the appearance of an engraved stamp. Extremely scarce and rarely seen in the market. An exceptional item for the Norwegian collection or Music/Composer collection. 1943 Edvard Grieg essay in Red, lower left corner margin 4-block; a potentially unique position piece! Imperforate, ungummed as "issued", on extremely smooth yellowish-white paper. Very high quality surface printing giving the appearance of an engraved stamp. Extremely scarce and rarely seen in the market. An exceptional item for the Norwegian collection or Music/Composer collection. 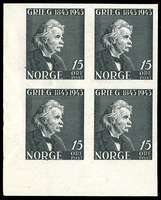 1943 Edvard Grieg essay in Black, single. Imperforate, ungummed as "issued", on extremely smooth yellowish-white paper. Very high quality surface printing giving the appearance of an engraved stamp. Extremely scarce and rarely seen in the market. An exceptional item for the Norwegian collection or Music/Composer collection. 1943 Edvard Grieg essay in Black, pair. Imperforate, ungummed as "issued", on extremely smooth yellowish-white paper. Very high quality surface printing giving the appearance of an engraved stamp. Extremely scarce and rarely seen in the market. An exceptional item for the Norwegian collection or Music/Composer collection. 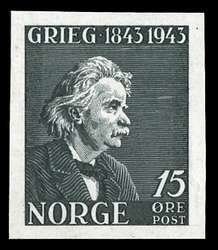 1943 Edvard Grieg essay in Black, lower left corner margin 4-block; a potentially unique position piece! Imperforate, ungummed as "issued", on extremely smooth yellowish-white paper. Very high quality surface printing giving the appearance of an engraved stamp. Extremely scarce and rarely seen in the market. An exceptional item for the Norwegian collection or Music/Composer collection.